I was all in for the Pretenders alone. Granted, Chrissie Hynde is the only original, consistent Pretender here after many generations of different lineups, the newest being completely different from any previous incarnations. While original drummer Martin Chambers put in an impressive performance, he no longer records with with them. She even joked that they've been together for 35 years and "You only get twenty for murder." It's her showthough, and it has been for some time. I was particularly excited because the Pretenders just dropped their first new album in eight years, Alone, last week. The set opened with the title track, which sounds like an ode to Iggy Pop with a hypnotic Stooges keyboard line. It was followed by the forthcoming single "Gotta Wait" and then by "Down The Wrong Way," from her 2014 solo outing, Stockholm. The first album deep cut, "Private Life," was something of a surprise, and the crowd loved every second of it. Going as deep into her catalog as there is, she pulled "Crying In The Night" from 1973's tragically out-of-print album Buckingham Nicks. It's a song that's never been played live before, butapparently Waddy Wachtel, Nicks' musical director and longtime guitarist, had his heart set on taking this one out on the road. 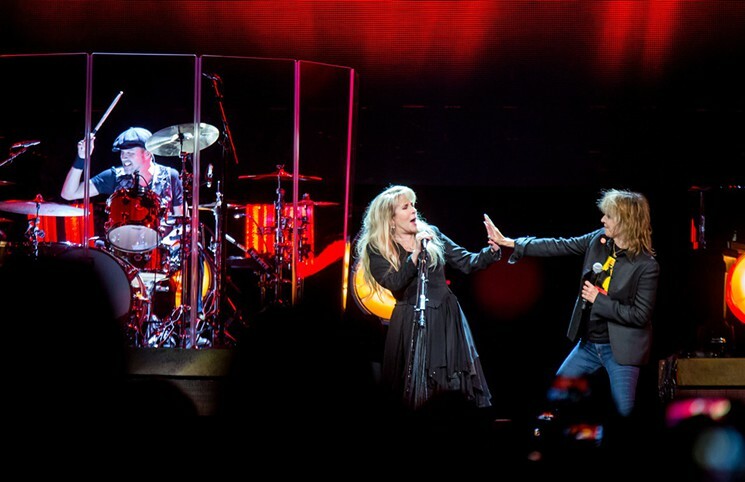 Nicks unleashed another Fleetwood Mac number with "Gold Dust Woman," and the crowd returned to their feet, if any had sat down. It was a fantastic number and a total nostalgia trip. Wachtel nailed the guitar part in no uncertain terms. The set ended with "Edge of Seventeen" from her first solo album and further projected tributes to Prince, before she bid us her first adieu. The Crowd: I haven't been to a show in a while where I feel especially young. Often, I may well be the oldest dude there and I'm guessing that 80 percent of this crowd exceeded my years. That said there were kids of all ages from 15 to 93, but the bulk of the crowd was rich white money that grew up in the 1970s who the Older Boomers called the Me Generation. This was their arena, this was their music, this was the sound of the suburbs in the 1970s and 1980s. Overheard: "I hope I look that good at 65." "Honey, don't be ridiculous, you don't look that good now." Random Notebook Dump One: I figured out what bothers me about the name Talking Stick Resort Arena. It's confusing; I don't know half the time if people are talking about the arena or the actual resort and casino. It should just be called Talking Stick Arena. Everyone gets the association. I was going to mention the number of times I got chills on this goosebump-inducing aural adventure, but I couldn't even keep track after 10, and that was halfway through the Pretenders set. I should make an appointment with a neurologist about this.